Hua Hin Beach Hua Hin Beach extends some six kilometres southwards from a rocky headland until Kao Takiap, a southern headland where a Buddhist temple clings to the cliffs. Hua Hin Railway Station This is Thailand’s most beautiful train station. The wooden building used to be a royal pavilion in Sanamchan Palace, Nakhon PathomPprovince. 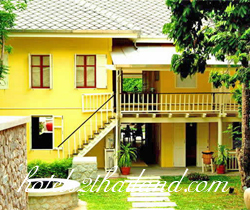 It was rebuilt at Hua Hin in 1968. Nightly Street Market a popular shopping market allowing people the opportunity for shopping, native-style seafood cooked on the spot and to witness local people’s lifestyle. Takiap Hill This hill, 4 kilometres from Hua Hin town, supports Buddhist temples and offers a commanding view of the resort, particularly early in the morning. Hin Lek Fai Hill Situated 3 kilometres west of Hua Hin district, Khao Hin Lek Fai or Flint Mountain is 162 metres high. On the mountaintop, there is a public park and scenic spots from where the scenery of Hua Hin and its surrounding area is visible. Tao Hill 13 kilometres south of Hua Hin, there is a 1- kilometre branch road on the left which leads to the spot with two beaches called Hat Sai Noi and Hat Sai Yai. Khao Tao is a traditional fishing village that also boasts spectacular temples. Pa La-u Waterfall This 11-tier scenic waterfall, some 60 kilometres west of Hua Hin, is located within a yearlong verdant forest where various kinds of birds and butterflies are found, especially in the morning. Spirit Houses of Brassiere Beach in the Khao Sam Roi Yot area where, according to Thai folklore, the spirit houses were built to appease the spirit of a fisherman’s daughter who was once torn to pieces and her breasts fell into the sea. She was killed because she was desired by too many men. Until this day, the locals still hang brassieres to the spirit houses praying for good luck. Wat Huay Mongkol was home to the immensely popular monk Luang Pu Thuat was famed for his ‘miracles’. Commissioned by the Queen of Thailand, Wat Huay Mongkol houses the largest statue of Luang Phor Thuat in Thailand in a park-like setting. Suan Son Pradiphat Beach 8 km south of Hua Hin, is a peaceful location which is owned by the Army Welfare Office. Plearnwan is a theme city under a nostalgic concept – Eco Vintage Village located at the opposite side of the royal residence of Klai Klangwan (Royal Palace, Huahin). The place is packed with classic Thai food and snack stalls such as Ga-Lor-Jee which taste like Japanese Moji, Kee-noo, Tang-Tem, etc. Butterfly Garden Opposite Klai Kangwon Palace, this is the first butterfly and herbal garden in Hua Hin. Surrounded by diverse local plants from all over Thailand, it features varied species of butterflies, birds, orchids, flowers and herbal plants. Popular activities in Hua Hin include: fishing, sea cruises to Sam Roi Yod Nat’l Park, eco-cruising, kite-boarding, fitness, martial arts, elephant camping, Thai massage, spa, cooking courses, trekking, walking, cycling, diving, snorkeling, arts, water sports, pony-riding and golf. Golf in particular is becoming especially popular, with Hua Hin increasingly being recognized as one of Thailand’s premier golfing destinations. The town hosted its first Asian tour event in 2009 at the new Black Mountain course, while other first class courses in easy reach include Royal Hua Hin, Banyan, Palm Hills, Majestic Creek, Lake View and Springfield. There are several driving ranges. Some foreign tourists go to Hua Hin and learn something like Thai cooking or Thai boxing. Hua Hin has very good kite boarding conditions with shallow and warm water. There is a northerly east wind from October until January with wind ranging between 15 to 25 knots. From February until May Hua Hin has a southerly Thermal wind that brings 15 to 20 knots in the afternoon. There are good conditions for kite surfing in both of these seasons. Several boat trips are available in Hua Hin-Pranburi area such as touring the river and watching birds or cruising the Gulf of Thailand with a Teak Wood boat for swimming, fishing and feeding monkeys at Sam Roi Yod Nat’l Park e.g. Siam Pearl Hua Hin offers daily tours including transportation from and back to the hotel. Hua Hin is a popular place for shopping. The Cicada Market, a charming market place nestled under big, old trees offers contemporary art handicrafts. The Khommaphat shop Hua Hin Thai Silk Village present hand-woven printed cotton, silk fabric silk weaving, embroidery and basket making. This little town also offers a wide range of taylors and jewellery stores, which sell gemstones, sapphires and rubies. However, that what makes Hua Hin this popular place are the small vendor shops, which have been in place already for many generations and which are still run by the whole family. There is also a large shopping mall called Market Village, which offers a variety of different brand shops and soon will have spaces available for small market stands. Hua Hin’s most famous local product is Khommaphat printed cotton which can be made into shirts, handkerchiefs, wraps, even elephants or fish, as well as decorative pieces such as pillows, bags and fans. Other local products include hand-woven cotton and a traditional Hua Hin-style duster. Most foreign-oriented nightlife is centred on Soi Bintabaht and Soi Selakam, where many typical beer bars are found. There are also the usual discothèques, karaoke bars, live music venues, and hotel bars. The pace of nightlife is much slower than in the larger tourist-oriented towns of Pattaya and Patong, while the proximity to the royal palace means that there are no go-go bars. Hua Hin is a predominantly Thai-Chinese area where most of the locals are engaged in some kind of business. Hua Hin has three established events. They are: Thailand’s International Kite Festival is during March, April and May and features stunt kites, big kites, little kites, high tech kites, traditional Thai kites, and displays of international kites. This festival is held only every other year. Hua Hin Jazz Festival June is the time of the year when ‘jazz on the beach’ happens at the annual Hua Hin Jazz Festival. The popular event attracts world class jazz musicians from Thailand and all over the world. Hua Hin Vintage Car Rally Hoteliers, the Vintage Car Club of Thailand, and the Tourism Authority of Thailand annually sponsor a parade of vintage and classic cars starting at the Sofitel Central in Bangkok and ending at the Sofitel Central Hua Hin Resort. The cars, with drivers and passengers decked out in 1920s attire, make the 225 km promenade in December of each year. The festivities culminate with a 1920s party at the Sofitel, which appropriately is a Victorian-style structure built in the 1920s. “International Cricket Sixes” Held at the Dusit Hotel, the dates change each year, but the event coincides with the Thai holiday of Songkran and the Christian Easter holiday. In 2012 the Hua Hin Film Festival was launched.